Spartan Press believe in putting the fun back into music education and provide a wide range of music publications to do just that, including their popular Flexible Ensemble Series. Spartan have many titles listed on the various examination and music festival syllabi. 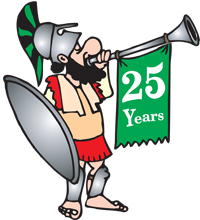 The now famous cartoons that appear on many Spartan covers are the work of the talented artist and model soldier designer Barry Lee, including the Spartan Herald Logo.